It's beginning to look a lot like Facebook will launch another mobile messaging app, one which destroys your communiqués after a certain amount of time. The rumour fell out when All Things D gave its sources a festive shake; they say that the app will hit before the year is out, allowing users to set how long their messages and shared photos are accessible for. Once that time period is exceeded, the photo, message or video will disappear from view and your correspondent will no longer be able to access it. It's a lot like the functionality of Snapchat, an app which has become the sexting app of choice given its messages' impermanence; its makers are no doubt quaking at the thought of Facebook stomping into Snapchat's domain. Facebook already has a selection of stand-alone mobile apps that are available separately from the traditional Facebook app. 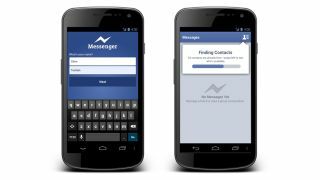 These include a Messenger app that it recently updated on Android to allow people who don't have Facebook accounts to use it - the sources gave no indication of whether or not this more salubrious messaging app will be locked to Facebook account holders only. If the insiders are right, the new Facebook app will hit app stores by the end of the year.